One of the wonderful things about life as a follower of Jesus is that it is ever changing. It’s not static, its dynamic. In fact when we read about the power that Christ gave to us…what he referred to in Acts 1:8...what he said that the disciples should wait for…was POWER. The word for power was “dunamis” where we get the word dynamite…in other words, dynamic power! If we can get our eyes on Christ, replace our agenda with His, then we open ourselves up to unlimited potential and possibility. The power that we tap into is explosive and transforming. There are no boring days when we wake up each day to serve a God whose mercies are "new every morning." His guidance is a steady stream, living water flowing into our lives… constant and consistent. He’s the tour guide that never gets out ahead of you…. the tour guide that makes it possible to understand Him as He is giving directions. He knows the way and all we have to do is follow. Maybe today you are in a rut, bored, and life is stagnant. Perhaps you have been stuck in a season or a place for such a long time that you've lost the enthusiasm for the things of God. Ask God to show you His "dunamis" power so that you can knock down those walls of complacency. 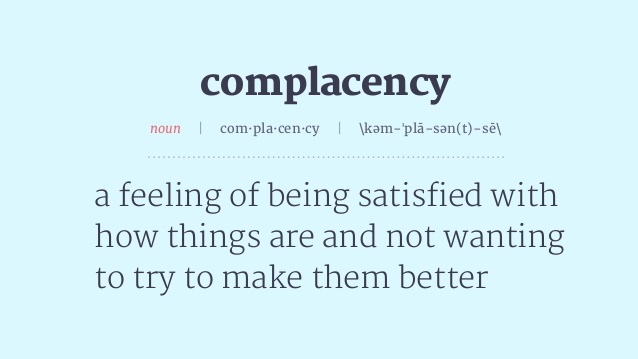 Today is the day you move from complacency to your place to be!